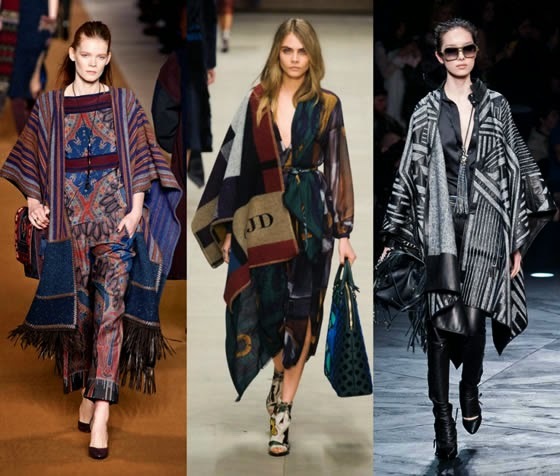 If there is an item that will be the Fall it trend is for sure the poncho! If you don’t have this piece in your shopping list yet, you need to add it asap! It only took a few shots of Cara Delevigne, Olivia Palermo, and others with the Burberry Prorsum monogrammed poncho, for this item to become the most desired thing of the moment. All the big retail stores have their versions of ponchos and the prices are great so if you have a little money invest in a poncho. Therefore I made a selection of some cool ponchos and some street style images. Hope you like it! Já tenho o meu, finalmente :D Comprei este fim-de-semana! Lindas inspirações que deixam qualquer look maravilhoso. Lindos esses ponchos tenha uma semana abençoada com muito sucesso.